The mountain streams of offer fantastic opportunities to go wild swimming on Skye. The temperature of the water might be daunting but the scenery ensures an unforgettable experience. The world famous Fairy Pools have attracted a lot of visitors since they were used to shoot a scene from the film Macbeth in 2015. They have been in the news more recently because of problems with over crowding and lack of parking. But in south Skye we have some awesome pools as well – they just haven’t been in a major motion picture – yet! This stream run over outcrops of Skye marble which is quarried nearby. The deep pools are not far from the Elgol-Broadford road so are easily accessible with plenty or parking on the shores of Loch Slapin. This stream runs from near the head of Loch Slapin and has numerous deep pools. Several of these are within a half mile or so the road. Look out for the legendary water horse of Loch na Sguabaidh. It is said that it has a liking for chasing attractive girls and to be chased by the beast is considered to be good for a girl’s reputation! For other wild swimming locations and recommendations try here. After wild swimming you’ll want a snug house to come back to and somewhere to dry your cozzy. 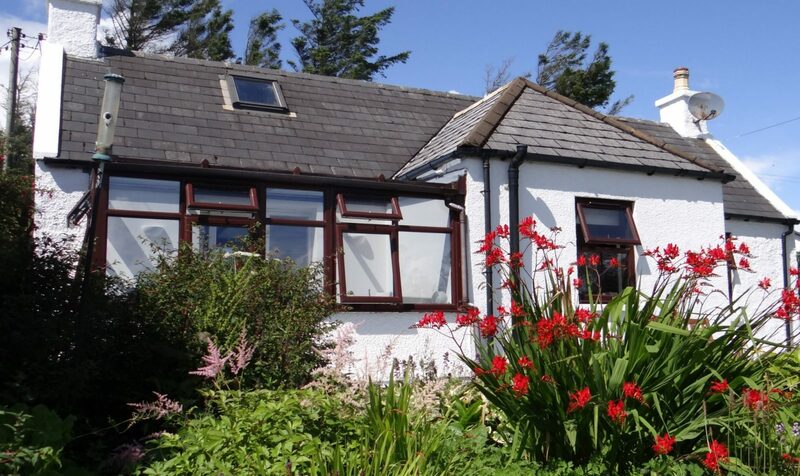 Springbank Cottage is nearby in Elgol and is a great base to explore from. If you want more than just a “standard” holiday cottage, then take a closer look. We hope you will be surprised by how much is on offer during a stay at Springbank Cottage.